What’s your favorite flatiron building downtown? 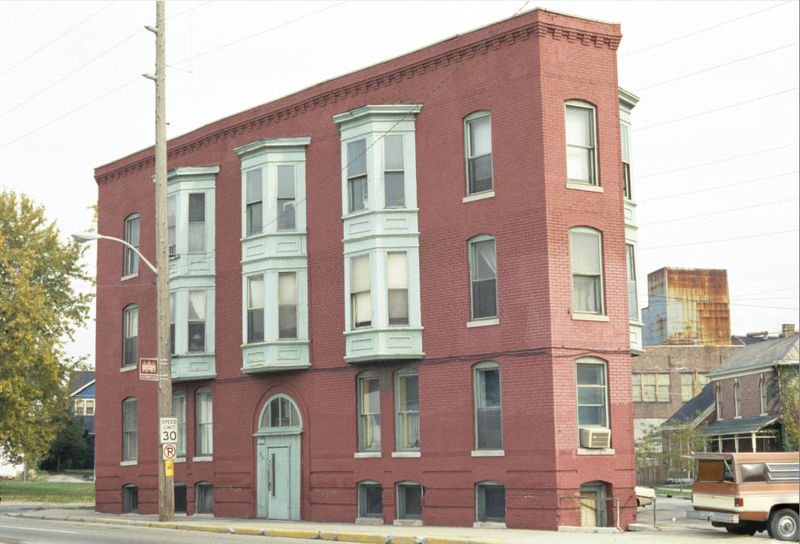 This apartment building is a potential contender–one of the oldest apartment buildings in Indianapolis. Six years after the Blacherne was constructed, the L’Avon was built in 1901 at 615 South Noble Street – now College Avenue. This three-story brick flatiron, full of bay windows, is roughly in the Queen Anne style, very rare for an apartment building in Indianapolis. 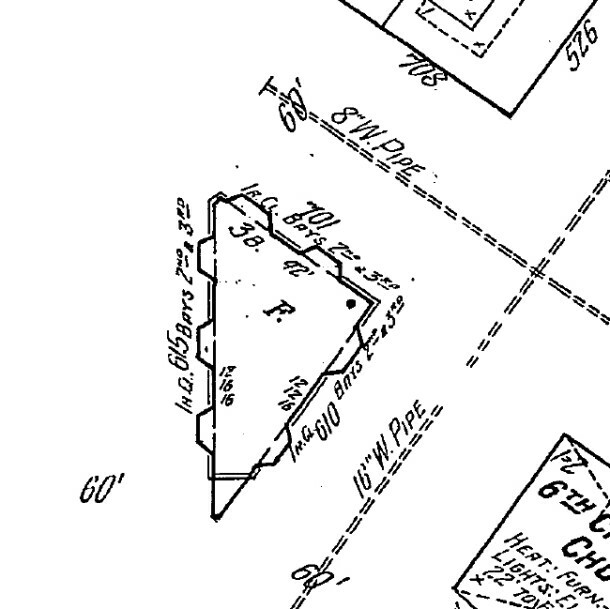 One of four apartments in the Fletcher Place district (the others being the Ada, B&B, and Briggs Flats), it is shaped by a unique triangular lot. The building utilizes the two more obtuse points and ends before the sharpest point on the south end of the building. The building has five bays on the western and eastern facades and four bays on the northern facade. Above the entrance and the paired windows are two-story wooden bay windows. 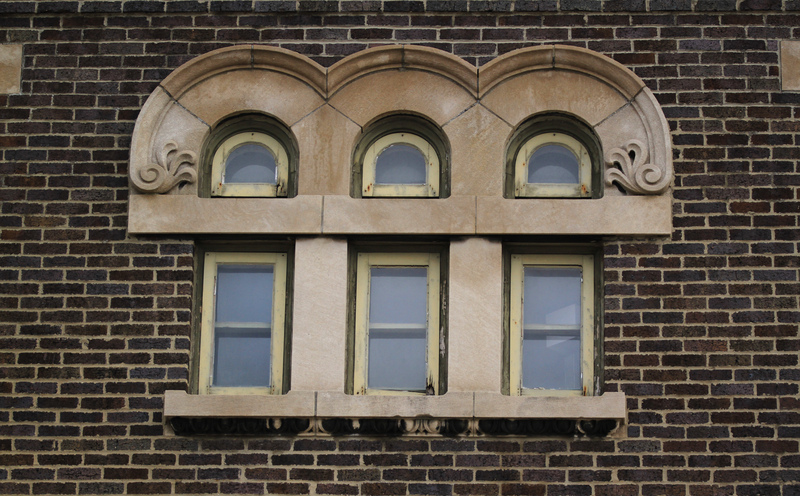 According to the IHPC district survey, it had a yellow brick string course along the second and third levels as well as the cornice at one time. The red brick was painted in the early 2000’s when the extensive damage to the brick on the western facade around the entrance was repaired for the sake of consistency. 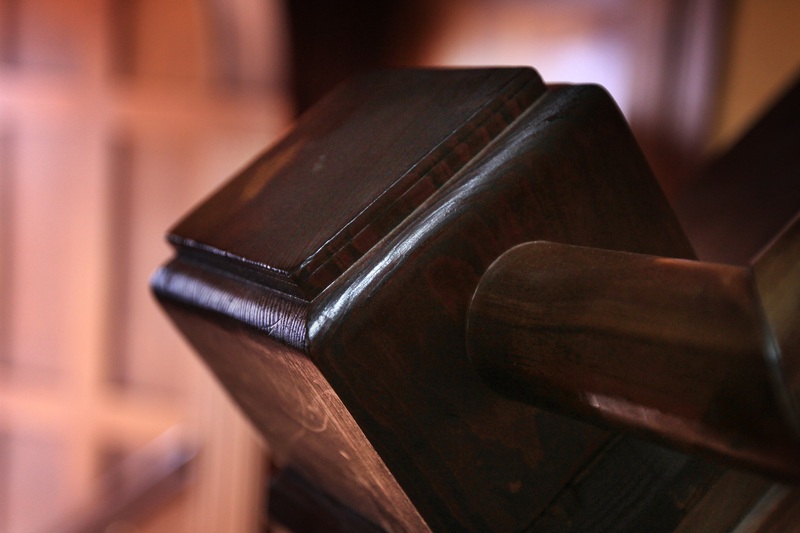 It also contains a rusticated raised basement. 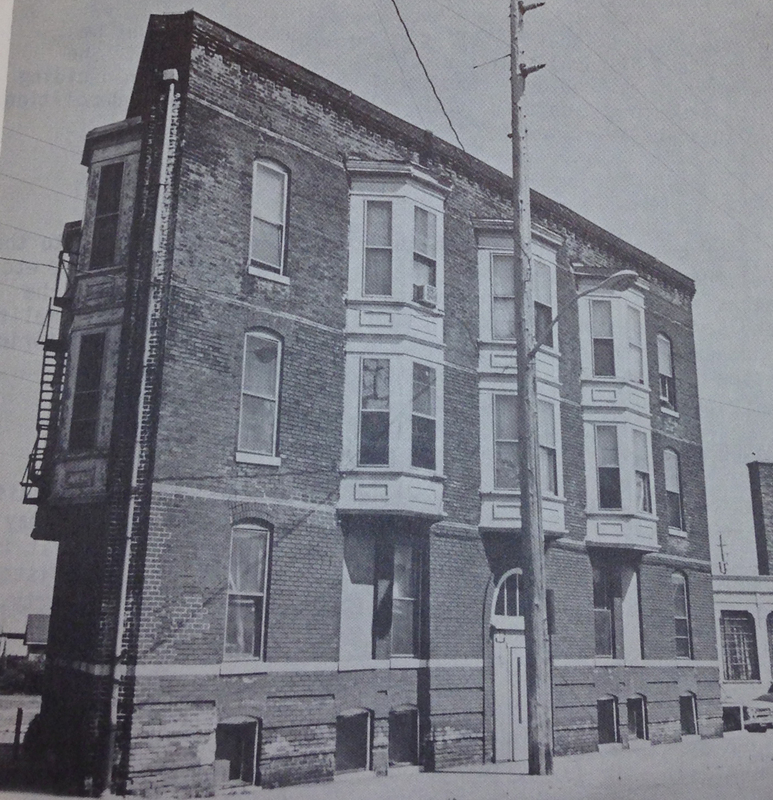 In 1887, most of the blocks surrounding the L’Avon were built up with single family homes and some duplexes and shops. The L’Avon lot was empty – perhaps no one knew how to use the awkwardly spaced small lot, with streets surrounding it on every side. By 1898, there was an attempt to make the best use of the space, with a one-story feed and hay store. 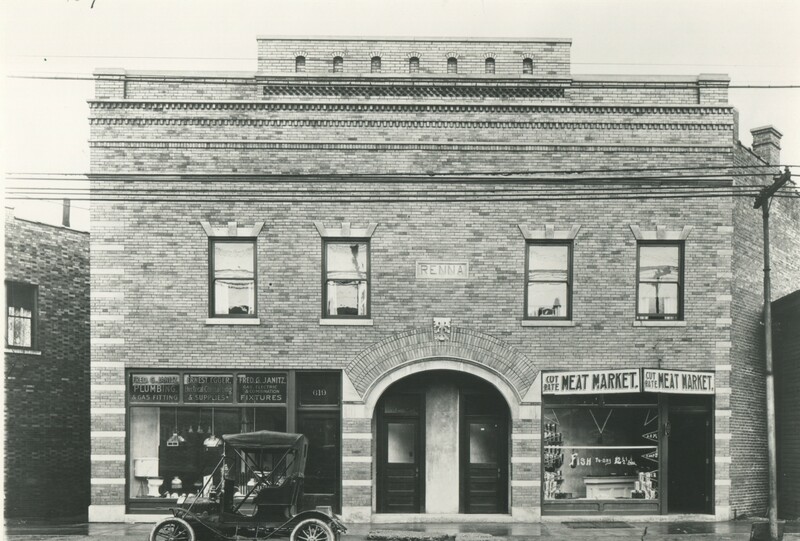 At this time, Virginia Avenue was filled up with one and two-story shops and some dwellings. Also, the 6th Christian Church was established across from the L’Avon on Pine Street. From 1910-1914, multiple advertisements for the apartments were published in the Indianapolis Star for two and three room units, priced at $11-17.50/month. By 1915, this was up to $26/month. Advertisements also boasted janitorial service by 1914. Half of the entire basement was also available for $10/month in 1910. During the popularity of independent baseball teams in the city, a team, the Indianapolis Giants, was organized by Eugene O. Wilson, who resided at the L’Avon. An advertisement by the Indianapolis Giants states that they desired “the services of a good pitcher, catcher, first baseman, and an outfielder, from 14 to 16 years old, immediately” and those interested should see Wilson at the L’Avon (IndyStar, 5/24/1911). Sadly, Wilson died two years later, at the age of 17, from tuberculosis (IndyStar, 9/26/1913). Another resident in the same year was a piano instructor, who gave lessons in her apartment for 50 cents (IndyStar, 2/25/1913). By 1914, many dwellings around had built additions to the back of their houses and larger ones were often converted into duplexes. 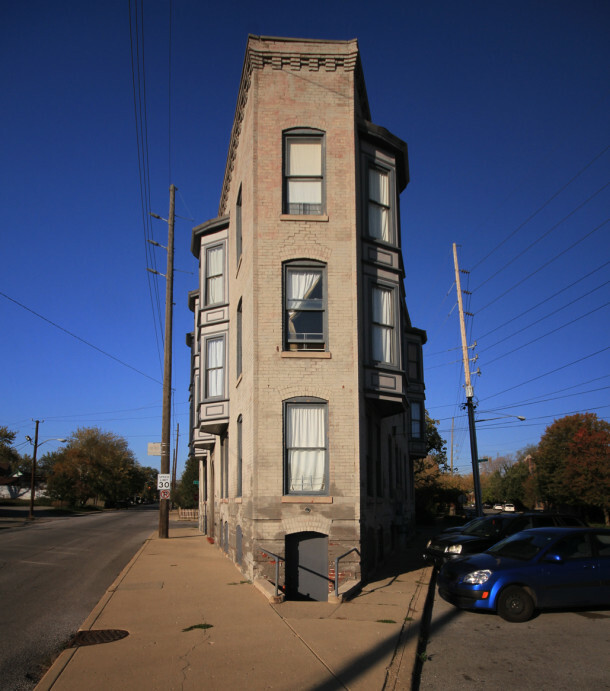 Across from the L’Avon’s west facade, there was a new saloon taking up the corner lot on the northwest side of the intersection of Virginia Avenue and Noble Street. By 1950, not much of the footprint of the neighborhood had changed in this particular intersection – some shops had changed hands or expanded and the church was now used by the Pilgrim Holiness Church. The areas off of Virginia Avenue remained primarily residential. 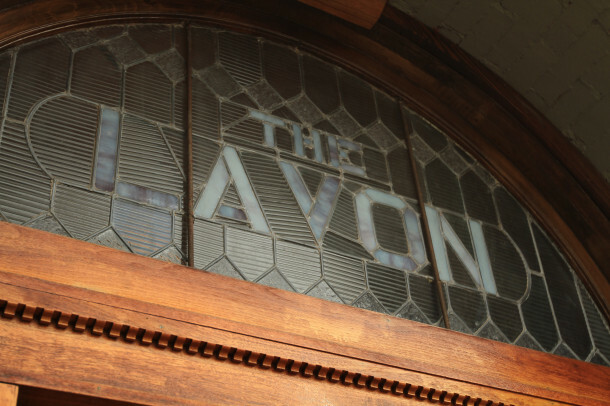 The L’Avon was included in the National Register of Historic Places for the Fletcher Place Historic District Neighborhood in 1982; it was given a “contributing” rating in the interim report. That year, it was owned by a local individual, but it appears she lost or sold the property after multiple complaints from IHPC in regards to the exterior were filed, which started in 1981. 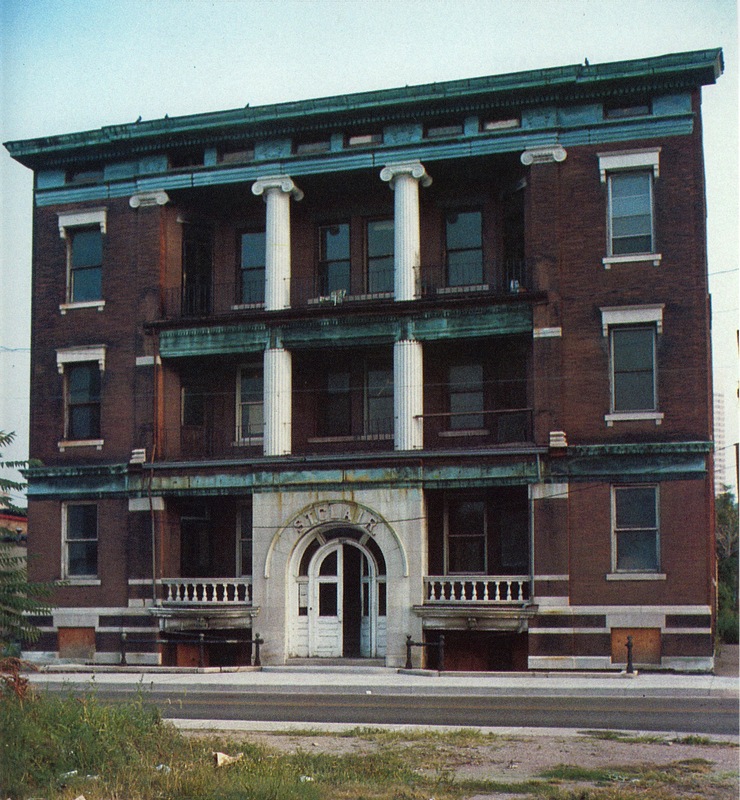 The building continued to fall into neglect in the 1980’s. In 1992, Paul E. Fipps of the L’Avon beat a homeless man, Norman Overway, to death for making insults at his wife (“Man Charged in Fatal Beating of Homeless Acquaintance,” David Remondini, IndyStar, 6/17/1992). The body was placed in a closet overnight before he left it in front of the L’Avon Apartments in the morning; blood was found outside of the building and leading into the apartment. The building was purchased by Pasco Enterprises, a company ostensibly located in St. Petersburg, Florida sometime in the 1990’s. 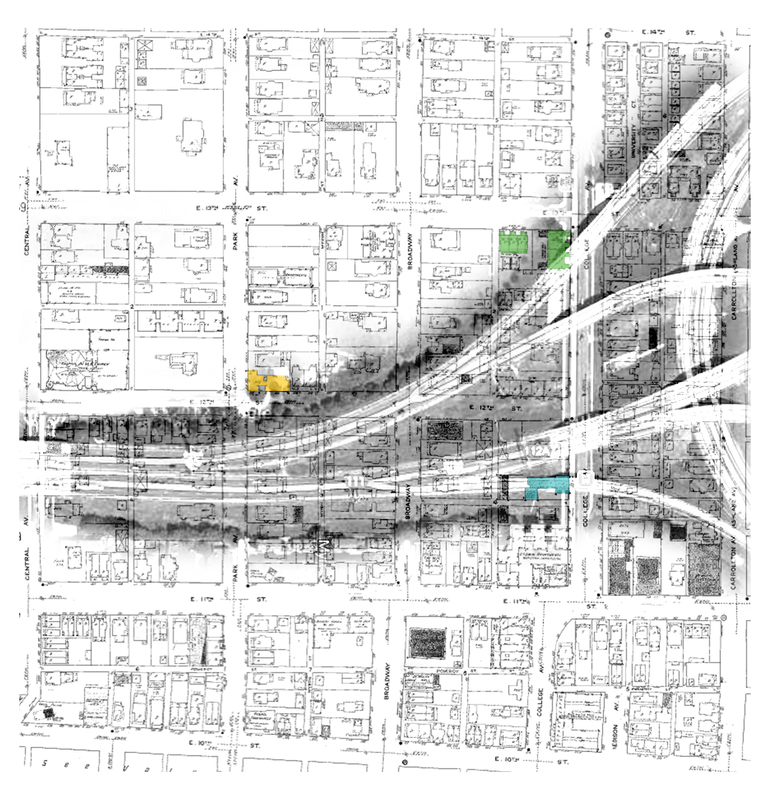 By 1999, IHPC rezoned the property from a C-5 commercial district to a D-8 dwelling district, as C-5 zoning did not allow for multi-family structures. There were many questions and concerns regarding the building’s vacancy and recent dark past. The current owners purchased the dilapidated structure in 2000 and began renovations the next year. At the time of purchase, the units were divided up into some very small rooms with shared hall bathrooms. 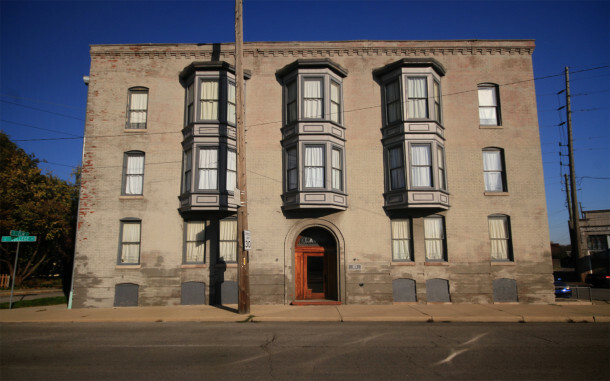 Some speculation exists that it was a former brothel, but more than likely it had been partitioned into standard small sleeping units for the working class. By 2005, the renovations were complete. Each floor is now its own spacious unit, which means an amazing opportunity to gaze at the 360 degree views of ever-improving Fletcher Place, as well as the downtown skyline. There are some particularly interesting views from rooms in corners with windows looking out on two facades. Over twenty windows grace a unit. The first floor unit has two bedrooms and a slightly smaller kitchen to accommodate the entry space and stairs to the basement and upper floors. 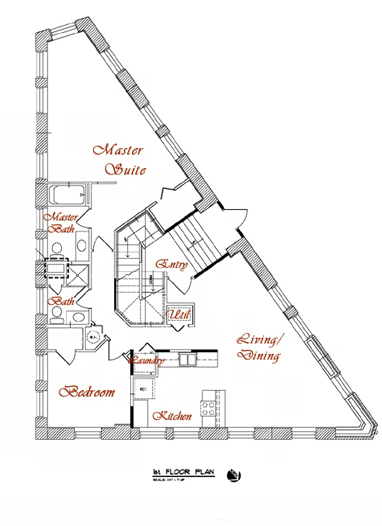 The second and third floor units are two bedrooms plus a den and larger kitchen areas. All three units have two full bathrooms. 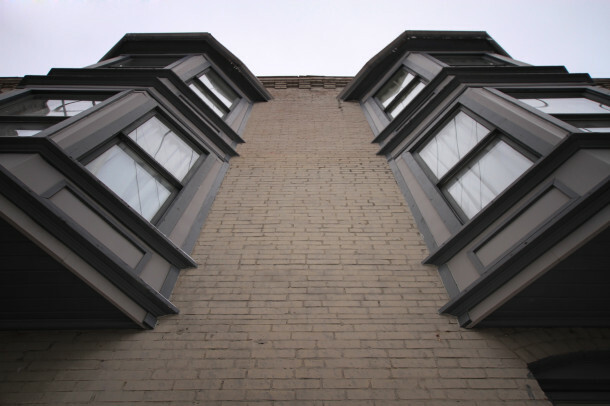 Unfortunately, most original features were already stripped or unsalvageable when the building was purchased. 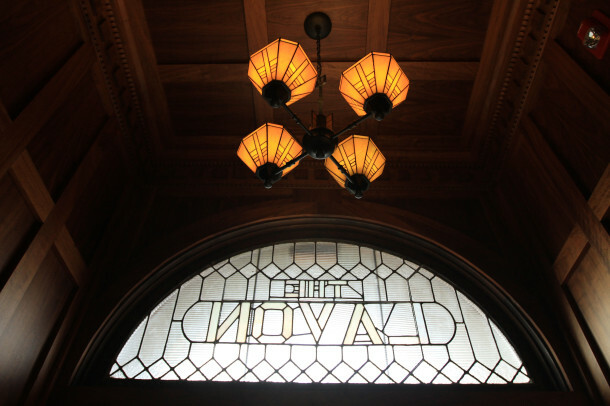 A few elements of the entry stairwell and the stained glass over the entry door are all that remains from the inside of the L’Avon. The building has very tall ceilings – originally 16 feet in most areas and 12 feet in others. The owner did not deviate from the original plan, opting to have 16 foot ceilings in all of the living spaces and dropping the ceiling only in the hallways to accommodate utilities. Thank you for the update on this building Jordan. I’ve passed by it many times and wondered at the history behind it and what was going to become of it. “Flats Saved” is becoming one of my favorite features! Jordan is doing an AWESOME job on this. HI is so lucky to have her as one of our contributors! Thanks so much! It’s such a unique building… the bottom floor is coming up for rent soon I believe! Speaking of Noble Street, about 11 blocks to the north there’s another old apartment house once called the Noble Flats (just north of the 501 Tavern at College and Michigan). They’re still there on Google street view, but I haven’t been by there in a while. Do you know if anything is happening with those? I was just driving by there, I think there was a for sale sign out front? I’m not sure, I’ll have to add it to my list. It is a very interesting building. Wish to stay with this informative blog! This is one of my favorite buildings, too! My fiance and I were just down in that area a couple weekends ago, walking around the area. He loved the architectural features of this building, so I was incredibly happy to see your write-up. It certainly has a history, especially during the ’80s. My grandparents lived here in the early 40’s, at the time my Dad was born. According the the City Directory, they lived in Apt #12 in 1942, and in 1943 it showed them living in the basement. I have a picture of my grandfather holding my dad as an infant while sitting on the railing for the stairs that led to the basement on the south end of the building.